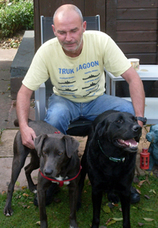 Mike Jones is a Canine Behaviourist and Trainer who has been working with dogs for more years than he cares to remember! He is currently owned by Barney, a six year old Labrador, and Milo, a Collie-Afghan cross of unknown age who arrived as a rescue to be worked with and ended up staying with Mike. Although Mike works with all breeds of dogs, his special area of interest is Pariah dogs and Livestock Guarding dogs. Pariah dogs give us a unique look into the history of pedigree dogs and the domestication process. Mike says that probably some of the earliest working dogs would have been livestock guarding dogs, hence his interest in their behaviour and temperament. Mike works with a number of canine organisations, including K9 Search UK, a non profit organisation that helps local pounds to find homes for surrenders and strays, and he also consults on behaviour issues. He is the author of the Canine First Responder Program, the UK’s first standardised Canine First Aid and CPR course and approved by Emergency First Response, the world’s largest First Aid and CPR Certification agency. Mike Believes that education is the key to understanding dogs better and has written several workshops and delivers these to dog owners and professionals within the industry. He is a full member of the Institute for Animal Care Education and a full member of the Companion Animal Behaviour Therapy Study Group which is affiliated to BSAVA. Mike is the Author of “A Short Study into Kennel Stress: The Effects of Environmental Enrichment, Trainer and Handler Interactions on the Re-Homing of Long Term Shelter Dogs,” which as of yet is unpublished. Mike supports the need for a regulatory body within the Behaviour and Training field as, at the moment in the UK, there are no regulations and anyone with no or limited qualifications or adequate insurance can set themselves up as a trainer or behaviourist.